I always put off reading this story because I thought it was a romance. Granted, I based this solely off the book cover, so imagine my delight as I got older and heard that it was instead, decidedly Gothic and creepy. The entire story is told through a flashback of events that occurred when the unnamed narrator is a hired companion for Mrs. Van Hopper, a gossipy brute of a woman. While traveling through Monte Carlo, they meet Maxim de Winter, whose story is one that Mrs. Van Hopper willingly offers up. Maxim's recent loss of his first wife Rebecca is a sad fate, and as the young narrator spends more time with him, they decide within only a few weeks that they will get married and move to his estate, entitled Manderley. But upon arriving to Maxim's estate, it becomes quite a different experience than she anticipated. The mansion is huge, with a full staff to keep up the house and grounds, and the ever-present ghost of the beautiful, social, and popular Rebecca is behind everything that is desirable about Manderley, and even the parties she's hosted are still talked about. But not only is she a part of Manderley's past, she is very much a part of a creepy and sinister presence about the house. Rebecca is everywhere that the new bride finds herself in - from the beautiful landscape of the grounds, the cove where Rebecca lost her life, the little cottage down by the sea that she used to rest in after she would go sailing. Rebecca is everywhere, and the new Mrs. De Winter, meek, quiet, and shy, cannot keep up. Even the housekeeper, Mrs. Danvers is cold and intimidating, harboring secrets that make the new bride fearful. She knows she is being compared by the housekeeper, the visitors to the house on their social calls, and she can't quite help feeling like even Maxim is doing the same, ultimately wondering if he is contemplating if he made the right choice to marry her. Last night I dreamt I went to Manderley again. It seemed to me I stood by the iron gate leading to the drive, and for a while, I could not enter, for the way was barred to me. There was a padlock and a chain upon the gate. I called in my dream to the lodge-keeper, and had no answer, and peering closer through the rusted spokes of the gate I saw that the lodge was uninhabited. No smoke came from the chimney, and the little lattice windows gaped forlorn. Then, like all dreamers, I was possessed of a sudden with supernatural powers and passed like a spirit through the barrier before me. The drive wound away in front of me, twisting and turning as it had always done, but as I advanced I was aware that a change had come upon it; it was narrow and unkept, not the drive that we had known. At first I was puzzled and did not understand, and it was only when I bent my head to avoid the low swinging branch of a tree that I realised what had happened. This is my third selection for the RIP VI Challenge hosted by Carl at Stainless Steel Droppings. I plan to watch the film adaptation soon for the challenge as well. 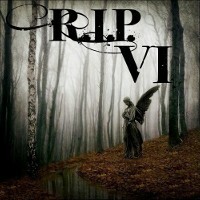 You can read more RIP reviews from other participants by clicking here. Did you know? Apparently, the author of The Woman in Black by Susan Hill (the film is soon to be released with Daniel Radcliffe in the lead!) wrote the sequel to Rebecca, entitled Mrs. De Winter. It was published in 1994, and reviews across Amazon and Barnes and Noble are varied. Have you read it? Daphne du Maurier was a British author and playwright, and was born in 1907 and passed in 1989. Her stories have been adapted for films, including The Birds and Don't Look Now, both done by Alfred Hitchcock. For a full bio of this incredible author, please click here. 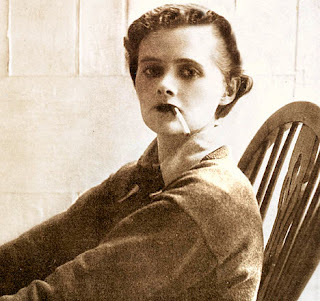 There are absolutely beautiful pictures of the author on that site, and it's clear that there will always be an established following of Daphne du Maurier. I thought this was a romance until I started reading blog reviews too. Why I haven't took the time to know what this is about before completely strikes me, sigh, I thought it was in the JaneAusten groupings. I am totally intrigued, I am loving the creepy feel books for RIP. The Restorer by Amanda Stevens was great too if interested Natalie. This is one of my all time favorites. I've reread it many times over the years and still enjoy the surprise at the end. I've read My Cousin Rachel by DuMaurier too but need to read some of her other work, including her short stories. I've heard good stuff about all of it! I have always thought this was a tacky romance too. Cover designers have a lot to answer for! I read Rebecca a couple of years ago. It wasn't what I expected when I picked it up, but it quickly became a favorite. This has been on my TBR for a scandalously long time. I need to just bite the bullet and read it. I only just read this last year and was amazed at how excellent it was! It's more of a psychological thriller than a romance. I've got her Jamaica Inn next up. I read it last year when my English team teacher assigned it to our advanced English class of 7th graders. You should of heard them grumbling. I wasn't sure either and then at a certain part we were all hooked reading Rebecca during silent reading in history. I love this book too! I'm not really into reading the sequel, even if it's goodish -- not a fan of Susan Hill as a person, and I don't like the whole idea of writing sequels to awesome stuff that can never, ever be nearly as awesome. I'm so glad you enjoyed Rebecca. I know what you mean about the cover! That's always bothered me. I think Ms. Danvers just might be one of the creepiest characters EVER! You're right, the cover doesn't fit this book at all. I probably wouldn't have read it except that in sixth or seventh grade my mom gave the book to me. I've read it a few times but not recently, and I've never read anything else by du Maurier - maybe it's time I read some of her stories? I didn't know that Susan Hill wrote the follow-up...but I so hate the idea of a writer cashing in on another writer's work with "sequels" that I'll continue avoiding it, even though Hill's on my reading list. I've read just about all of DuMaurier's books and recommend all of them. I've also read mystery books inspired by Rebecca, notably a recent one, The Lantern by Deborah Lawrenson. I recommend that one too! This is yet another classic that I need to tackle! I have a copy; I just haven't gotten a chance to! This is one that I need to read, and haven't yet. I have heard some amazing things about it, and even tried to get my book club to pick it for our last year's Halloween read, but they refused. After hearing how you felt about it I know it's something that I need to read very soon. Great review, Natalie! It's funny you didn't want to read this because it looks like a romance. Just the other day my husband saw it on my stack and was like, "Are you reading a trashy book?" Haha. But I absolutely loved it when I read it in the 8th grade and I can't wait to read it again. I also read the sequel about ten years ago. I don't remember much about it except that it was extremely dark and depressing - not in a delightfully creepy way, just in a "let's make this as bleak as humanly possible way." So I would maybe not recommend that sequel. Rebecca is a great book. I wish I had never read it so I could read it again for the first time, because re reading is just not the same. The mystery caught me completely off guard. So I waited to read this one for far too long because of the awful cover, but when I finally read it I was blown away. The movie is actually my favorite Hitchcock film. I just read The Woman in Black, which was amazing, but I had no idea she wrote a sequel to this. I'll have to check it out! I absolutely adore Rebecca. It is my favorite book of all time. My friends who have never read the book often tease me about my favorite being a romance novel, but they have no idea. I'm glad you enjoyed it! Great review! Agree: the Jackie Collins cover is a mistake! You now need to see the Hitchcock adaptation. He captured the claustrophobia and paranoia of the book perfectly. This is one of my favourite books. I saw the play about six years ago, and read the book a couple of years after that. I was blown away by it; although I definitely think it was influenced heavily by Jane Eyre (which is another of my very favourite reads ever). The cover of the book that's shown in your picture isn't very representative of the story inside, is it?! No wonder you thought it was a romance! You're making me crave a reread of this! I have not read the sequel by Susan Hill, but I'm interested, even if the reviews are varied. I loved this book too. I finished My Cousin Rachel last week and have Frenchman's Creek waiting for me. Didn't know there was a sequel by Susan Hill but I now need to see if my library has a copy. Love the photo of DuMaurier. I read this last year for the RIP Challenge and was pleasantly surprised. I really want to see the movie now! Wonderful review!! This is one of those I started reading and really liked but had to stop for review books and never got back to it. I think I'll take your advice and read it this month or next. And I don't care for the cover and also think it looks too romance-y. I have the sequel but of course haven't read it! I am reluctant to read this one, because it is creepy. Funny, because that's the same reason why I didn't want to read Dracula, which I eventually did, and loved so much! I need to just push down my worry and read this one. This sounds fantastic, I've been wanting to read this author for some time now. Wonderful review. uh oh I thought this was a romance too! *hangs head in shame* It does sound fantastic and yet another book I can't believe I haven't read yet but is now on my list. Ugh, I hate that cover. I really do. It's the one reason why I put off reading Rebecca for so many years. Like you, I thought it was one of those romantic books!! When I read it (the edition I eventually read had a really nice cover, comparatively), I was floored. It was amazing, and I felt like I had to read everything else by Daphne Du Maurier. I'm reading The House On The Strand right now, which is quite enjoyable. My Cousin Rachel was the other one which I loved. I was so glad that the store had a selection of covers when I bought Rebecca, because I DID NOT want this one! :) So glad you decided to give it a shot anyway - isn't it wonderful? I read about it year ago and have been meaning to read more of her stuff. I really need to get on that! I absolutely adore this book. So glad you enjoyed it. I just checked out My Cousin Rachel by Du Maurier from the library and can't wait to read it. 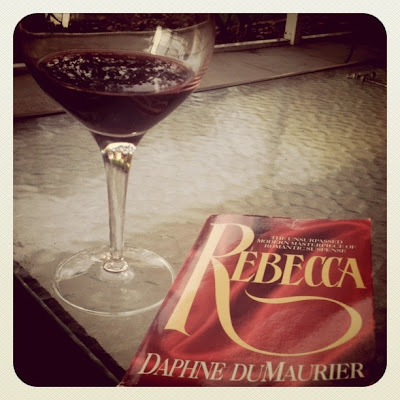 I loved Rebecca when I first read it and plan on rereading it again at some point. I'm glad to hear that you enjoyed this one so much! I think I read a copy of Rebecca with that same cover pictured above--making it look like a horrid trashy romance novel! Fortunately I had seen the movie and had at least some idea what I was actually getting with the book. I love it; it has some of the most beautiful writing of anything I've read.